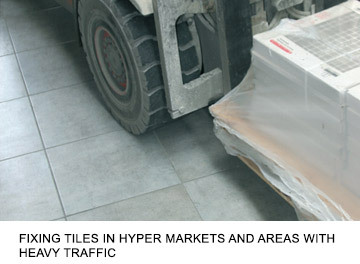 Fixing tiles in areas with high mechanical or rolling stresses is a technical operation that must be carried out with the greatest care and using proven techniques. The applicator must therefore be Qualibat 6.3-3.4T accredited. • Treatment of the substrate: the substrate must always be abrasive cleaned. • P2 and P3 classified self levelling mortars are not suitable. The tiles must comply with the UPEC classification of the area concerned. AREAS OF APPLICATION: fixing tiles on new or existing floors in U4 P4S and U4 P4 classified commercial premises (shops, public kitchens). New work concerns the extension of existing areas. • Concrete slabs on an earth platform laid in compliance with the Professional Codes of Practice stipulated in the "Work on Slab Floors" Reports of the French Institut Technique du Bâtiment et des Travaux Publics ( ITBTP) n° 482 March-April 90”, and be at least one month old. • Self supporting slab flooring conforming to the stipulations of the NF P 18 201 (DTU 21) specification “Concrete Works" and aged at least 3 months. • Concrete slabs on an earth platform and self supporting slab flooring, with existing coverings. - pressed and extruded ceramic tiles. - Natural stone: limestone, marble or granite paving. - Terrazzo paving (made out of cementing material and aggregate). - Slab or concrete floors treated by powdering or with the incorporation of slurry, conforming to the ITBTP Professional Codes of Practice stipulated in "Work of Slab Floors". - Natural cleavable stone coverings such as schists, slates. - Floor paints (epoxy, polyurethane). • Planeness: tolerance less than 5 mm under a 2 m ruler. • Preparation of the substrate: substrates should always be sanded down beforehand. The main contractor is responsible for assessing the works before establishing the tender for bids. The works inspector then establishes his report. The contract documents should indicate which areas of covering are to be conserved and which removed. In particular, they should detail any areas in which the planeness tolerance will be greater than 5 mm under a 2 m ruler. The expansion joints in the structure should be detailed in this document. • Determination of the % area of existing covering to conserve: Natural stone and terrazzo coverings, untreated concrete and concrete treated by powdering or with the incorporation of slurry. 2- By a sounding test. The sounding should be carried out on the areas within the control joints or in areas less than 100 m2. If the defective area is greater than 10 % of the total area, the complete covering should be removed from the area concerned. • Loose ceramic tiles: If only a few, scattered tiles are loose, the areas should be filled. If there are large areas of loose tiles, the anchoring mortar should be removed completely. • Loose terrazzo and natural stone coverings: The anchoring mortar should always be removed completely. • Paints: Completely remove any by appropriate mechanical means (e.g. sanding). • Semi-flexible tiles and reconstituted polyester tiles: all the coverings, namely the floor covering, the adhesive and any floor levelling compound should be removed completely. New substrates should always be sanded down. • Ceramic tiles, natural stone and terrazzo: remove the surface "sheen" (due to soiling and maintenance products) by sanding down with rough grain abrasive (with a buffing machine or similar) then wash with causting cleaning solution and rinse thoroughly. • Uncoated concrete (or concrete treated by powdering or the incorporation of slurry). The substrate should always be sanded down beforehand. • Localised filling and repair work: this should be done with the adhesive mortar the day before fixing the tiles, as work proceeds. Localised areas up to 10 mm deep may be filled. - MORTIER 350 made up with CERMILATEX and applied over a CERMILATEX cement slurry anchoring coat (see Technical Data Sheet). (The same precautions should be taken for preparing the substrate as for direct bonding). – CERMIDUR Express* admixed with washed and dried sand with a particle size of 0-4 mm at a rate of 25 kg of CERMIDUR Express* powder to 25 kg of sand. Mix up 50 kg with 7 L of latex. Wait 5 to 6 hours after carrying out the repair work before fixing the tiles. * Available on request. NB: Do not use P2 and P3 classified self-levelling smoothing mortars. Only the P4 SR classified floor mortar RAGREROC RAPID is authorised. Before beginning the work, the applicator must check the correct preparation of the substrate by carrying out an adhesion test on each type of substrate. 1- A sample area of the substrate is prepared before tiling. 2- The type of tile that will be used as the final covering is cut up into ten 5 x 5 cm sections and then bonded to the substrate using the selected adhesive. 3- The tiles should be fixed in accordance with the instructions given by the manufacturer of the adhesive mortar. 4- After allowing it to set for the recommended waiting time, corresponding to the type of traffic for which the area will be used, adhesion measurements are carried out using a manual or electric pulling device. • The 2 extreme values out of the 10 tiles sections are eliminated. • The following points should be noted carefully. If both types of rupture occur, the approximate percentage of each type of rupture should be noted. B) The ambient temperature while the tile samples are bonded and when the adhesion tests are carried out. (1) Note: When carrying out these tests on existing tiling, a plate for spreading out the load (shown below) should be placed between the test device and the substrate in order to avoid arching the substrate. * This requirement only applies to the test plate. The tiles should conform to the UPEC classification for the area in question. The quality consistence of the work should be checked as work proceeds. Apart from checking (per 100 cm2 area) that at least 70 % of the adhesive has been properly transferred to the backs of the tiles, the adhesion should be checked every 500 m2 then 2000 m2 then every 1000 m2 according to the validation test procedures described above. • 5 mm in the case of epoxy mortars. Jointing mortar: CERMIJOINT TX + CERMILATEX or EPOSOL epoxy based) depending on the room's requirements. • Expansion joints: an industrial mechanical system suited for this use must be employed. It must be fixed to the building carcass as per the manufacturer's instructions. Tiles must not be cut at the level of the expansion joints. • Control joints: the control joints in the covering must follow the contraction joints of the slabs on an earth platform. These joints must be planned as a function of the tile pattern layout and must be filled with a mastic with Shore A hardness 70-80 placed at the base of the joint for U4P4S areas, or another appropriate manufactured system. • The existing expansion joints should be removed and reformed, starting from the original substrate. Do not place tile cuts in line with these new joints. • Control joints- on existing tiling, the joints do not have to be reproduced in the new covering - on floors (cf. CPT specification n° 3530). • Peripheral and abutment joints: 5 mm minimum left empty or filled with a resilient material. - Junction zone between existing substrate - reworked substrate. It is necessary to consolidate the bonding plane with a 5 mm mesh reinforcement mesh (DESVRES range). The fixation of the tiles will not improve planeness or horizontality. The planeness tolerances of the finished work can only be, at the best, identical to those of the existing substrate.